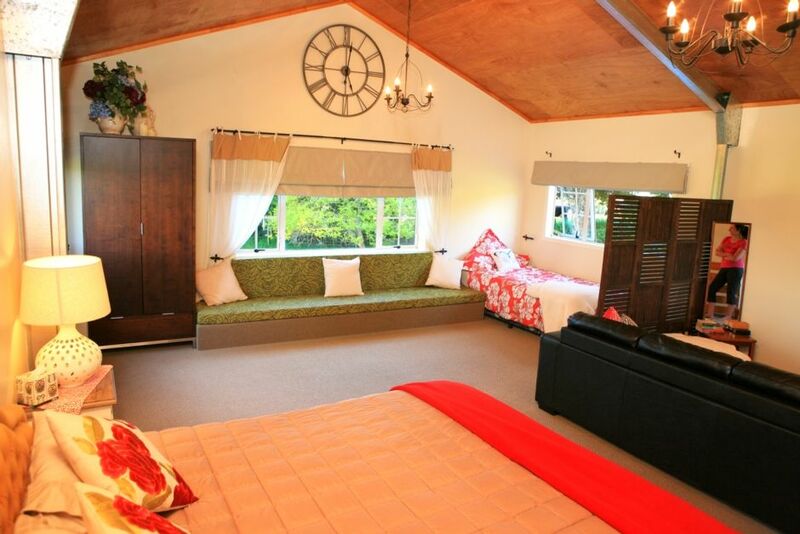 The stand alone Loft self contained accommodation is situated in the lovely Waikato. Enjoy a weekend as a couple or with a group of friends. We are central to the many attractions of the area. Go for a walk up into the Maungatautari Mountain enclosure and enjoy the bush or maybe drive to the Waikato River Trails for a bike ride. Visit the Hobbiton movie set, or 12 minutes to Lake Karapiro to watch the rowing or other events that are hosted there over the year. 5 Minutes further on into Cambridge township to enjoy the Cafes and Restaurants. The accommodation is fully equipped for a weekend stay (or longer) with towels and linen supplied. Kitchenette features standard fridge/freezer, microwave, jug, toaster, electric, fry pan, etc. and BBQ.There is more than just a room to stay in. Feel free to roam through to the Bathhouse garden and take a coffee or glass of wine and enjoy the view of the Waikato River and surrounding farm land. Tea, coffee, milk and sugar and welcome basket supplied and a continental breakfast can be supplied on request. If guests require washing done for longer term stays we are happy to do this up in the hosts house. Centrally located in the Waikato close to Hobbiton, Waikato River Trails ,Maungatautari Mountain. This is a lovely peaceful property where you can come and just relax. Enjoy the tui's, native kaka, fantails, and occasional wood pigeons that fly through our property. We also have our own chickens and sheep, one who particularly likes a good pat. We look onto Mt Maugatautari (Sanctuary Mountain). It has been pest proof fenced and has a lovely walking track inside for you to experience a treasured part of New Zealand's bush and bird life. From the top of the property you get an amazing panoramic view of the Waikato River. Just lovely to sit and watch whats going on below even if it is just the swans. We have a covered outside eating area plus small table and chairs upstairs that can seat 4. A lovely quite spot. The loft is tastefully decorated, very comfortable and clean.The garden is a treat with different spots to relax in and enjoy the views. Loved the door leading to the bathhouse! Thanks very much. Thank you Therese. Our pleasure having you stay and so pleased you were able to relax at the end of your day. Very clean, simple and comfortable place. The Loft is located in a beautiful, quiet location. The Loft is located in a beautiful, quiet location. Absolutely loved the spacious room and homely touches. Enjoyed using the BBQ area- perfect for outdoor cooking! Gorgeous gardens!! We are central to some great local attractions such as the Waikato River trails if you are into bike riding or even walking along the Waikato River. Also Sanctuary Mountain which has been pest proof fenced to protect our wonderful native flora and fauna. Also only a 20 minute drive to Hobbiton Movie Set, 25 minutes to the Avanti Velodrome near Cambridge and 12 minutes to Lake Karapiro the home of NZ rowing just a few of the wonderful features of our area.